01. First Come First Served (FCFS). Preemptive Shortest Job First (SJF) is a CPU scheduling algorithm in which the CPU, at any given time, looks for the job with the shortest burst time among the jobs in hand and starts processing it. In SJF the processor will not just pick the job that arrived first, rather will compare them based on their required CPU time and will pick the one which requires lowest amount of time. 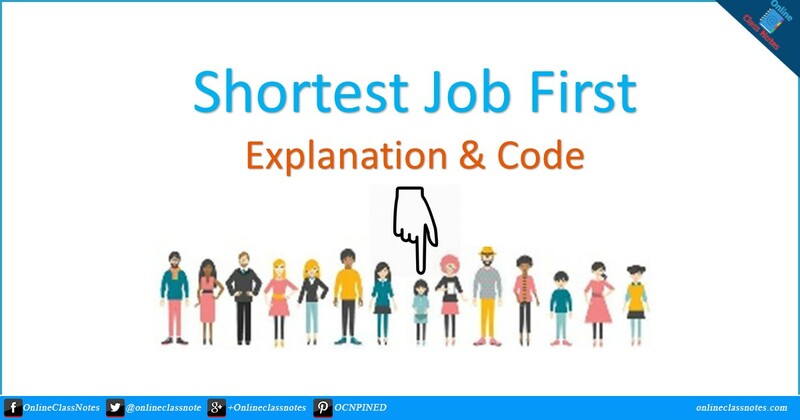 Here, Arrival Time is the time when a process has arrived the queue, Job ID is used instead of the job name, and Burst Time is the amount of time CPU will need to process a job. Well, as the unit of time you can take anything like nano-second, second, minute etc whatever, we are considering it as seconds. Now for an instance, consider the above queue as the ready queue for the CPU, that is, the CPU will be taking jobs from this queue and will process it. There is only 1 job, that is JOB-1 with a burst time of 3 seconds. So CPU will do 1 second job of JOB-1. Thus JOB-1 has 2 seconds more job to be done. So as both of the jobs has equal amount of jobs to be done, CPU will follow First Come First Served method and do the job that arrived earlier, which is JOB-1. So CPU will process JOB-1 for 1 second. Finally, JOB-1 has 1 second of job remaining. Here, 2 jobs has the shortest amount of job to be done, which are JOB-1 and JOB-2. CPU will do the job that arrived earlier, which is JOB-1. So CPU will process JOB-1 for 1 second. Finally, JOB-1 has is done. Here, JOB-3 has the shortest amount of job to be done. CPU will do 1 second of job of JOB-3. So JOB-3 has is done. There is only 1 job, which is JOB-2 with remaining 1 seconds of job. So CPU will do 1 second of job of JOB-2. Thus JOB-2 is done. JOB-2 Arrived at the queue at second 1 with a Burst Time of 2 seconds. But CPU started processing JOB-2 at 4th second. So JOB-2 waited for 3 seconds.But JOB-1 didn’t wait. AND JOB-3 Arrived at the queue at second 2 with a Burst Time of 1 second. CPU started processing JOB-3 at 3rd second. So JOB-3 waited for 1 second. You will ask the user for the number of jobs. Then for each job you will take its Process Number, Arrival Time and its Burst time. You don’t have to worry, the number of processes wont be more than 5 or 6, Arrival time of a process can only be equal or greater than the arrival time of its previous process and Process will be entered as a serial number, so no problem. Beneath this, you will have to show the Average Waiting Time. You can download my program to try it out. After you have written the program upload the .exe (not the code) and let me and others try it. I am sure you will enjoy it. However, this is the second program of Process Scheduling and a bit harder than FCFS. Later we will work on, Priority Scheduling and Round Robin. I am sure you will love them all.